UNITED NATIONS, March 25 -- UN Secretary General Ban on March 25 backed away from a $1 trillion request he made in a March 20 letter to the participants in the upcoming meeting in London. 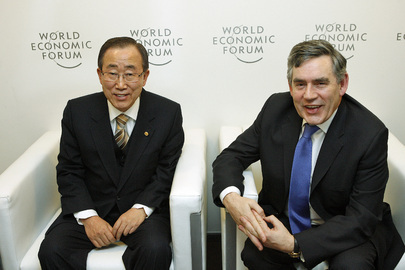 Moments after UK Prime Minister Gordon Brown said that, as he prepared to travel to Brazil and Chile, it is too early to put a number on what poorer countries will need, Ban Ki-moon was asked to confirm his $1 trillion request, contained not only in the March 20 letter but also in a Financial Times article placed online earlier on Wednesday. He said "at this time I am not in a position to say anything in exact amount terms." That was that last question his spokesperson allowed, so it was not possible to ask what had changed between his use of the $1 trillion amount in the March 20 letter and an interview with the Financial Times that day and his meeting with Gordon Brown five days later. To some, it was reminiscent of a similar about-face triggered earlier this month when, in a closed-door meeting with the U.S. House Foreign Affairs Committee, Ban read from talking points that the U.S. is "a deadbeat" which owes the UN between $1 billion and $1.6 billion. That night, his spokesperson's office put an an e-mail to reporters "clarifying" that Ban respects the U.S.'s contributions. Hours later, President Barack Obama's spokesman Robert Gibbs called Ban's use of the word deadbeat "unfortunate" and suggested that he make clear his gratitude to the U.S.. Here, a word from Gordon Brown that perhaps the number should have been given out -- to the UK-based Financial Times -- led to a de facto retraction. How should the recipients of Ban's March 20 letter now read it? Just as Inner City Press dug into "deadbeat-gate" by asking who wrote Ban's talking points -- numerous UN sources pointed the finger at the UN Information Center in Washington -- Inner City Press understands, from multiple sources, that Ban in his March 20 interview gave the $1 trillion figure on an "exclusive basis," adding that it should be held for some time closer to the G-20 meeting. This exchange of delay for exclusivity was then altered by a decision, on March 24, to release the $1 trillion figure in connection with Ban's meeting and press availability with Gordon Brown on the afternoon of March 25. Beating that deadline, the Financial Times published the quote and letter with the $1 trillion figure, which Ban proceeded to implicitly deny or retract. Can we call it "trillion-gate"? Looking through the -Gate, Ban's $1 trillion, while a suspiciously round number, appears to consist most of pre-existing commitments, such as those made at Gleneagles, and to include loans by the World Bank and IMF. The World Bank's Bob Zoelick weeks ago proposed that 0.7% of rich countries' bailouts and stimulus packages should go toward a "Vulnerability Fund" for poorer countries. Click here for Inner City Press' February story on that. Notably, Gordon Brown endorsed the World Bank's Zoelick's, and not the UN's Ban's, proposal on Wednesday. Another UN body, appointed by the President of the General Assembly and former Nicaraguan foreign minister Miguel d'Escoto Brockman and chaired by Joseph Stiglitz, raises Zoelick's stakes to a full 1% of countries' bailouts and stimulus packages. That still doesn't approach Ban's seemingly arbitrary $1 trillion figure, which may explain the Trillion's unceremonious retraction. Which of its various shifting plans the UN actually promotes, and with what effect, at the G-20 in London remains to be seen. Footnote: to continue with Deadbeat-Gate, while Ban and his officials including from Peacekeeping used a figure on Capitol Hill this month that the U.S. owes $1.6 billion to the UN, when a reporter asked Ban's spokesperson for a breakdown, the answer was that the information was available "upstairs" in the Spokesperson's Office. But up there the referral was to the UNA-USA lobbying organization. Senior UN officials told Inner City Press on March 25 that the real debt is $1.1 billion, and expressed surprise that the UN would use another figure and then hide behind an "outside NGO." The UN's work is often important, but this is no way to run this ship.